For getting around the city during San Fermin its best to either walk or go by public transport and forget about the car altogether as traffic is chaotic in the city centre, with endless traffic jams. 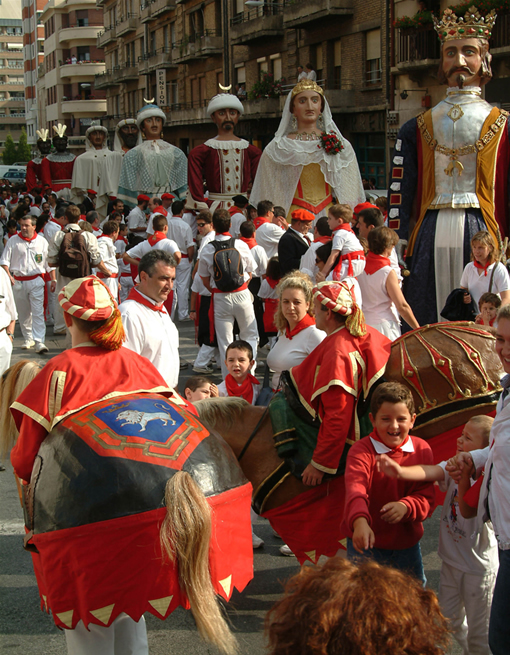 There are extra buses running during the fiestas (in Pamplona buses are called "Villavesas") with a frequency of at least one every ten to fifteen minutes. There are also a number of night buses operating which link the outskirts with the city centre. For further information the Pamplona Bus Service customer enquiry phone is +34 948 42 32 42. Another option is to take a taxi, which has official metered rates. Unlike other places, in Pamplona taxis are not generally hailed in the street, the custom is to go to a taxi stand or phone a taxi company: Tele Taxi San Fermin on 948 35 13 35. During the San Fermin fiestas, the continuous crowds of people enjoying the fiestas in a relaxed, carefree atmosphere make the city an ideal place for pickpockets and thieves in general. Keep an eye on your bag and wallet at all times, particularly in the crowds. If you've got a backpack, wear it on your front and only carry what you absolutely need, with an authorised photocopy of your personal documentation. To avoid theft, you are advised not to wear or carry unnecessary expensive items such as gold chains, watches, jewellery, cameras, etc. particularly at the fairground and the open-air evening dances. In particular, do not take part in games of chance set up on the streets, bets and proposals for easy, quick profits, the police is constantly advising of these con tricks and swindles. To get in contact with the police, you can either dial the emergency phone number 112 or the Navarre Police (Policía Foral) directly: 948-20 29 20. During the San Fermin fiestas there is generally a mobile Navarre Police office in addition to the Citizen Information Office set up in the porch of the Palace of Navarre in the Plaza del Castillo square, open 24 hours a day. Please remember that the tow-away service operates throughout the San Fermin fiestas, so you need to be aware of the regulations and restrictions when parking your car. To contact this service, dial 948 420 444. Firstly, during the San Fermin fiestas and following days, the "Blue Zone" in the city centre is free of charge. However, this should not be confused with the "Green Zone" which is exclusively for residents and you will be fined for parking in a spot demarcated by green lines. These places are very close to the city centre. Also, to avoid theft, you are advised not to leave anything in view. It is forbidden to park lorries, buses and coaches in the built up area. Neither is it permitted to park caravans or any type of home-vehicle in the municipality, unless with express authorisation to do so. During the festivities, the Government of Navarre reinforces the number of health-care professionals and increases the accident response means. For minor injuries, there are first aid stations located in highly frequented areas and at mass or risk events. In addition, the bullring has a medical centre and highly specialised medical team. Listed below are a series of health care emergency phones: 112, Hospital Virgen del Camino: 848 42 94 00, Hospital de Navarra: 848 42 22 22, Clínica Universitaria: 948 25 54 00, Serv. Navarro de Salud (Navarre health service): 848 42 91 00, Cruz roja Red cross information: 948 20 65 70, DYA information: 948 17 17 17, Chemists on duty: 948 22 21 11, Asociación de ayuda en carretera (Road assistance association): 948 12 12 12, for the whole of Spain: 94 410 10 10 , S.O.S. Navarre: Road status 088 and 112, Municipal police: 092, State Police (: 091, Civil Guard: 900 10 10 62 and Citizen Information: 010.